Camping Tips & guidelines if you’re new to camping. First of all I have to say that I’m not someone who goes camping too often. But I do come across the problems some people have when they go camping for the first time and my years of experience will hopefully make these tips worth reading. And if you’re taking the kids on their first tent experience you will find that staying with us will ensure everyone has a great time. Staying with us here at Lane Cove River Tourist Park is an ideal destination for that first trip for a few very good reasons. Close to home if you forget something, inexpensive, great facilities and a beautiful setting in a National Park only 10 kms from the Harbour Bridge. You will be parked right next to your site, one of the two very well equipped camp kitchens will be within easy reach as will be one of the four amenities blocks. The following are some tips on how to approach the first camping trip or for people that don’t go camping very often. I hope you will find the following information useful. And check out the links at the bottom of the page for some great camp site photos. Before you visit us it is always a good idea to at least open up the bags and get some idea of how things go together. But if you haven’t done that then the following will still apply. And if you are buying a tent don’t get one that is too small. A two man tent is just big enough for two people to sleep in but nothing else. For those people that don’t have a tent or are looking at upgrading, we will soon have a range of high quality canvas tents available to buy. Lay the tent out on the ground and work out which way you want the front to face. The vast majority of our tent sites are very level but if the tent site has any sort of slope it’s worth considering sleeping positions as well. Best to have your head on the higher side and not be positioned so you will feel like you are rolling down a hill. If your tent has a separate ‘fly’ this is the time to position it. A ‘fly’ covers the main tent and is designed to have a space between the main tent and the fly so that any dew or rain will be caught by the fly and not penetrate the main structure of the tent. Oh, if you’re cooking on one of the many BBQs located throughout the Lane Cove River Tourist Park don’t leave it unattended. Our Kookaburras have been known to take a steak right off the hotplate! Please don’t deliberately feed the wildlife and birds but if you must feed them only let them have fruit. And if you have forgotten to bring something essential with you? Don’t worry, you can always pop home and get it. Below are some links to a good range of photos for you to view and these photos will give you a taste of what you will experience when you visit us. Follow this link for Guidelines for new campers. Two dedicated campgrounds are set within the Park. Designed specially for the camper, the majority of sites have a vehicle space next to them and room for a ten- person tent. Camp sites do not have concrete slabs but many have power and running water. The powered campground is located within close proximity to one of two camp kitchen, an amenities and laundry block. There are free electric BBQs set amidst native landscaped gardens for use by campers (This is the area used by Home and Away as the Summer Bay Caravan Park). The non-powered camp ground has a bush kitchen with fridges and microwave, toaster, instant hot water, and free use BBQ s. These sites are large and grassy and back onto the National Park. Power points are available for recharging mobile phones and laptops. 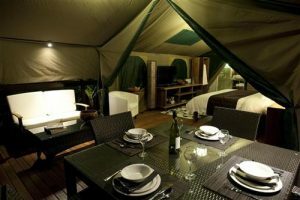 Many camp and tent sites are set under the shade of large gum trees and other natives. 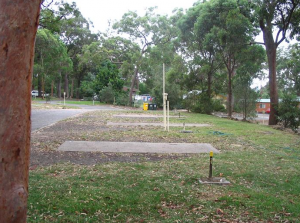 Camping is becoming increasingly popular at Lane Cove River Tourist Park. Many families from the greater Sydney region (as well as from the rest of the country and overseas) are choosing to visit us for a relaxing few days where everyone can appreciate the Australian bush yet be within easy strike of public transport & Sydney’s many world class attractions. The kids (and the kids amongst us) can take a stroll down to the river for a short walk or an extended one. Or you can just relax at your camp site and listen to the native birds. Lane Cove River Tourist Caravan Park is definitely one of the most unique locations in Sydney. Not only our customers think so, check out our awards page. 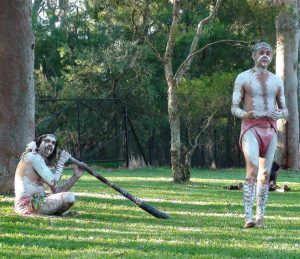 Aboriginal Cultural Performances at Lane Cove River Tourist Park! Our artists will return on Wednesday 21 September 2011 at 6pm for their first performance to start off the new season. We are very pleased to be able to partner with Tribal Warrior to provide our guests with a comprehenisve and interactive Indigenous Cultural Experience. Wednesday nights during summer and autumn, the park plays host to local Indigenous Culture perfromed by two professional artists. The performance usually starts with the haunting sounds of the didgereedoo, the artists then take you on a journey discussing and interpreting their culture from days long gone. Guests are encouraged to participate in traditional dance and song – become an emu or a kangaroo for the evening, have your questions answered and get to know the guys. The Australian Indigenous Culture is the oldest living culture in the world and a snap shot of it is available free for visitors and guests every Wednesday night (weather permitting) from 6:30pm – bring along a picnic rug or a chair or just sit on the grass, it’s something truly unique to experience as part of your Lane Cove River Tourist park visit. The content of the performances is wholly developed and managed by the Indigenous Community, funds paid by the park go directly to the performers and providing Indigenous work opportunities within the community. We acknowledge the traditional owners of our land and pay our respects to their Elders both past and present. Please check with the office (02 9888 9133) if you wish to attend. A variety of powered and non-powered caravan sites, which are designed to fit the smallest to the largest vans. All sites have a concrete slab and vehicle parking space. Sites are conveniently located close by amenities blocks, and manyl enjoy uninterrupted views to the National Park. has embarked on site regeneration programs, which includes native planting, and a new variety of turf designed for the rigours of caravan sites. All caravan sites are large & have ample room for an annex, your car and often space for a table and chairs outside of the annexed area of the van. All sites have sullage and water. If you have a television booster installed the best reception is obtained by bypassing it. The Park has two specific drive through caravan sites which need to be booked in advance. Many people visit us for the natural environment you will encounter while you are here. The animals & bird life in particular. On any site you will always be close to the bushland of Lane Cove National Park which is very easy to access from our own dedicated walking track. Visit our video page to see some examples. Please take care of the environment while you’re with us but also enjoy the many kilometres of walking tracks within the National Park. See our credentials regarding our commitment to Ecotourism: Certifications & Awards. A variety of powered and non powered sites which are designed to suit campervans and motor homes. The sites can accommodate a small pop top right through to converted buses and the largest Winnebagos & fifthwheelers. Most sites have a concrete slab and plenty of turf. Sites are conveniently located close by amenities blocks, and some enjoy uninterrupted views to the National Park. Campervan sites and Motor home sites are separated from caravan areas. If you are coming to Sydney from interstate or intrastate, and looking for a great place to park your campervan, ask the people who are staying where you are now. Many people come to us because of a personal recommendation. Once you have visited us you’ll recommend us to your friends too! The Park has embarked on site regeneration programs, which include native planting, and a new variety of turf designed for the rigors of camper sites. All sites have sullage and water. Television reception in most areas of the park is good but if you use a ‘booster’ you are advised to bypass it. Spaceship Australia have a new approach to hiring a campervan & you get a discount of 10% on our site fees when you hire from them & stay with us. provide an Australian wide pick up or drop off point. And they hire four wheel drive vehicles as well. Why not do a comparison? Campervans or Campers are a great alternative to towing a caravan around. Having a campervan means easier set up, less hassle & less cost. Many of the bigger motorhomes & campervans are easily the size of a large caravan with on board facilities of bathrooms & kitchens. Some sleep two, some sleep eight! Even the smaller ones are well equipped & are easily driven. ‘My First Time Camping’ is another new option from Lane Cove River Tourist Park (Gold award winner for Best Tourist Park and Campground in NSW for 2010 from NSW tourism) . This is specifically designed to make an overnight camping experience very simple and straightforward. And above all, relaxed. *Conditions re pricing. $165.00 price is based on a family of four. For extra people, please call us. *Maximum and minimum numbers of tents/available reservations will be determined by the park. *For group enquiries, please contact us. *Parking available for one vehicle per booking. *Available selected nights only, single night bookings only (Wednesday nights are our regular Cultural performance nights). *We reserve our right to vary, alter or otherwise amend this offer at anytime.